A Star is Born is a classic tale re-envisioned for modern audiences, with Bradley Cooper’s directorial debut showcasing the talent he holds as well as the star potential of everyone involved. The movie is about a rock star that falls in love with a girl after watching her sing at a dive bar. It follows their journey from strangers to partners and how the industry affects them. Right out the gate, it shines with personality from the leads. 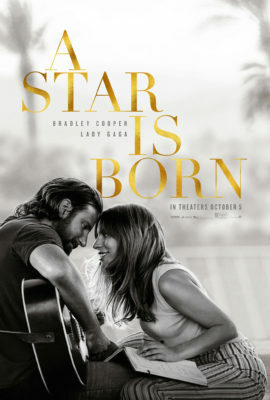 Bradley Cooper shows some of his best work here as a top of his game musician whose fall from grace is counteracted by the relationship he holds with his partner. The surprise performance that also holds a bit of Oscar buzz is Lady Gaga. She has always shown her musical ability as being one of the best in the business, however, it’s always difficult translating passion in a song over towards film. Thankfully, she surprises moviegoers with such a relatable and honest character that I stopped seeing her as Lady Gaga and saw her as Ally. Another great surprise was Dave Chappelle as Bradley Cooper’s childhood friend. Especially for his dark sense of humour, it was nice to see Dave Chappelle in a dramatic role that both compliments his acting chops as well as shows his range from comedian to actor. The show’s plot is very relatable toward modern ideas. It does present a theme that has been told a hundred times about the trouble of holding onto fame and the problems and struggles that it brings. There was a moment that was a bit jarring and seemed a bit political for a character drama, though it was brought up in a way that gives it a chance to be discussed. The directing is well-executed with certain shots being very effective and impactful, however, it is either very good or mundane. Bradley Cooper showcases his cast and gives them opportunities to shine, yet is average while attempting to display setting. It never dips into a negative shot and other than a few instances, it’s passable for the effect it was attempting to show. One of the best aspects of the film is the soundtrack, with many of the original songs being either head-bangers, emotional soothers or nice driving tunes. When a movie depends on songs it can be distracting, though the songs in A Star is Born hold both as a great companion to the movie and as great songs themselves. Ultimately, A Star is born is a wonderful piece of film that gives good performances all around. From its surprising acting connecting to its viewers, the soundtrack having audiences tap their feet to the plot that, although isn’t new in any sense, keeps interest in a way that is captivating. A Star is a born should be discussed, if not for Oscars than the impact that it has on how people view the life of a star in general.